1. Knead wheat flour, required water and salt to a thick dough. 2. Combine potato, onion, tomatoes, coriander leaves, mint leaves, ginger, green chillies, chilli powder and salt. 3. Mix until all the vegetables are mashed and mixed well. 4. Pinch small balls of the dough and roll into a medium size round. 5. Add 1 tsp oil and spread 2 tsp of the vegetable mixture. 6. 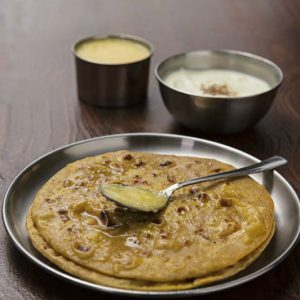 Fold the edges and roll again into a thick paratha. 7. Heat a tawa over moderate flame. 8. Place the paratha on the tawa and cook on both sides till done. 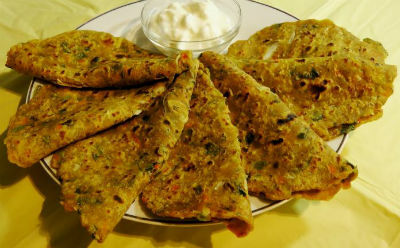 Feel free to comment or share your thoughts on this Mixed Veg Paratha Recipe from Awesome Cuisine.